This Sunday's Catch up will be short and sweet. I have had a busy weekend treating one of my closest friend because it's her birthday. It's been a lovely girlie time with pamper treatments, delicious lunch and pink fizz. I even baked a Vegan Chocolate Birthday cake. Even though she doesn't have allergies I opted for a Vegan recipe so that I could join in. 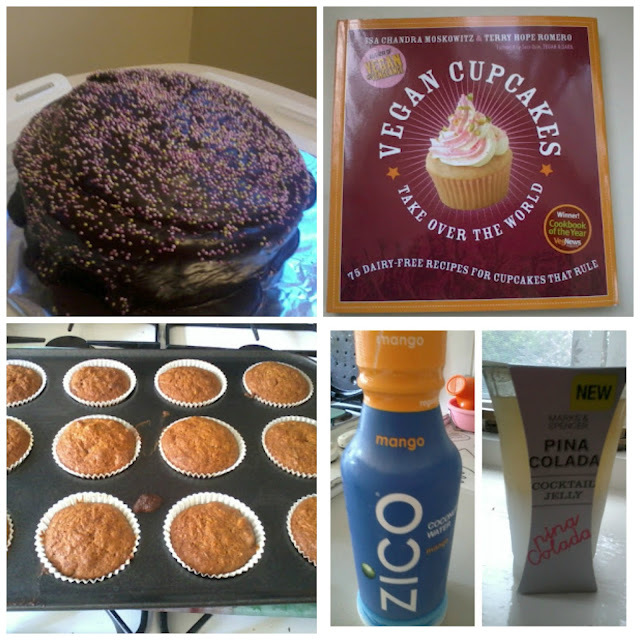 I recently ordered a Vegan Cupcake cookbook which arrived last Saturday. It may be familiar to you as I already have the cookie version and have blogged a few cookie pictures. It is a US cookbook so measurement are in cups (which I prefer) and some ingredients need substituting or translating to a UK equivalent. As soon as I saw the Carrot Cupcakes I had to make them. I adore carrot cake but have been unable to eat it for many years. I didn't make the cream "cheese" frosting as I currently don't have a soft dairy free substitute that I enjoy. The cakes are so moist and I love them. I have been trying out coconut waters as and when I see them. So far my favourite is Icoco, I thought Vita Coco did not taste pleasant. This one I grabbed at Tesco it tastes of coconut but I think they left out the mango! I also found a rather tasty Pina Colada jelly at Marks & Spencer. I ordered a sample hand cream from Skinny Dip. Their products are free from parabens, sls, mineral oils, artificial fragrances and not tested on animals. I ordered Viva la Diva cream it is very pleasant but I am not a fan of the fragrance so will probably not order a full size product. I think that is all for this post. Hope everyone is having/had a lovely weekend and I look forward to your comments. I love coconut water! The packed drinks are available easily but it can never beat straight out of the nut drink!